A little break as we wind towards the end of our East Crete Upland Village Tour. This week sees the true midwinter between the Winter Solstice and the Spring Equinox. This is the coldest part of the year here in Crete (as it is in the rest of the northern hemisphere) so I thought I’d compile a little list of some of the things to look out for in the coming weeks. February 1st was long considered the beginning of the year before Julius Ceasar got his hands on the calendar and it is still celebrated as such in the Pagan wheel of the year as Imbolc. A time for resolutions (in case your January 1stones have gone by the board) and for starting the spring cleaning (watch out for the Greek version: Clean Monday on February 19thwhich is a national holiday). Or if all that sounds a bit onerous why not have a midwinter party instead and celebrate the oncoming warmer weather? 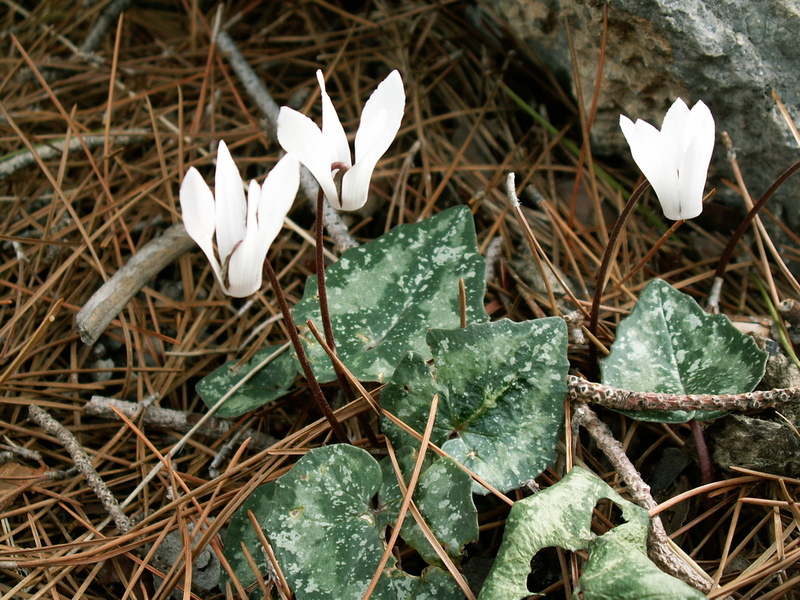 This is a lovely little Cyclamen endemic to Crete, where it is widespread, as well as to a couple of locations on Karpathos. Look for it in damp rocky places, such as winter stream gullies, growing in the shade. Keep an eye out also for Iris unguicularis,Almond trees coming into flower (Prunus dulcis)and the first appearance of Cretan Ebony (Ebenus cretica). These are they guys that make the pine trees look as though they are hoarding candyfloss in their branches. 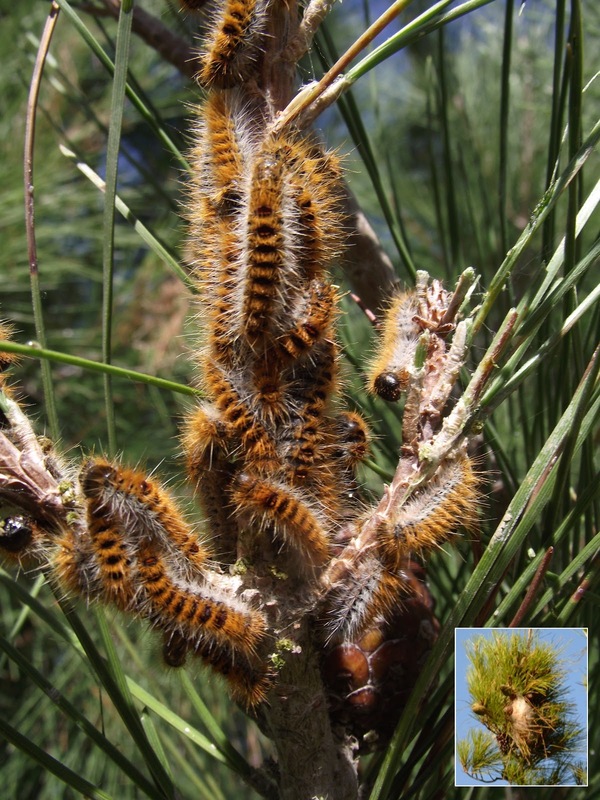 They will be leaving their nests in the next few weeks and heading down to the ground, nose to tail, in long columns where they will pupate in the earth, emerging as adult moths in late spring or early summer. Late winter is also a good time to watch for migratory moths taking advantage of the warmer temperatures here in the south. Look out too for the Oil Beetle, Meloe tuccius foraging about in the grasslands, looking as though he is wearing some other beetle’s wing cases that are a few sizes too small for him. 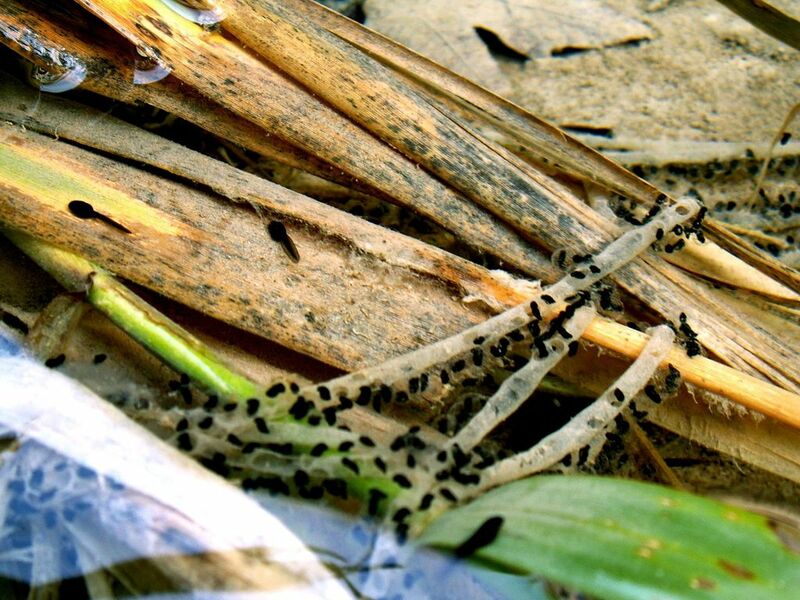 Time to be children again and collect a bit of toad spawn. If you haven’t got a pond in your garden yet then build one and stock it with a few of these long strands (toads lay spawn in strings, frogs lay spawn in clumps). Not only do they provide hours of interest for all ages as they develop into tadpoles and then toads but as adults they are particularly adept at mollusc management in the garden. Whilst you are out collecting try a bit of rock flipping to look for hibernating Ocellated Bronze Skinks, Chalcides ocellatus, or maybe, if you’re exceptionally lucky, a Leopard Snake, Zamenis situla. Although the Goldfinch is resident all year round here in Crete their numbers are swollen considerably at this time as they migrate down from the colder areas of northern Europe to visit their cousins for a winter warm up. With less vegetation about at this time of year they are also considerably easier to spot. This is also a good time of year to visit your local reservoir as a great variety of waterfowl visit Crete in the winter. Next week it’s back to the tour and I’ve found an interesting clearing in a pine wood to the west of Agios Stefanos that is just itching to be investigated.